NIU Athletics will recognize the contributions and accomplishments of Huskie women student-athlete alumni from the pre-Title IX era (1961-1981) during the NIU Legacy Celebration, Friday-Saturday, Feb. 15-16. Among the highlights of the weekend’s events will be the awarding of varsity letters to student-athlete alumni during a breakfast reception in the South Lobby of the Convocation Center prior to Saturday’s (Feb. 16), NIU women’s basketball game vs. Toledo. 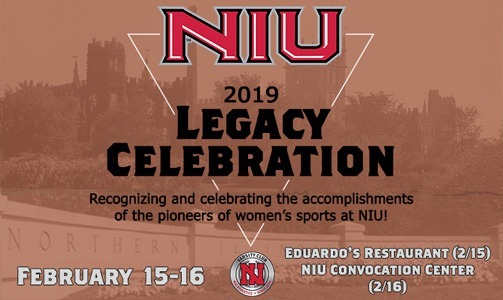 The NIU Legacy Celebration kicks off Friday evening (Feb. 15) with a gathering at 5 p.m. at Eduardo’s Restaurant in downtown DeKalb. Appetizers will be provided and a cash bar will be available. Saturday’s breakfast reception honoring NIU women student-athlete alumni from the pre-Title IX era will take place from 9 a.m. to noon in the NIU Convocation Center. The group also will be recognized at halftime during the NIU vs. Toledo women’s basketball game which tips off at 1 p.m. as the first half of a Huskie Basketball doubleheader that day. NIU varsity student-athlete alumni and guests can register online for the NIU Legacy Celebration or by emailing varsityclub@niu.edu. Please include full name and number of guest attending. The deadline for online reservations for the NIU Legacy Celebration is Saturday, Feb. 9. Additional information about the event is available via the Huskie Varsity Club’s Facebook page, or by contacting Brad Hoey at 815-753-6667.